This cave house is located approximately 14 miles southeast of Winkelman in the central part of the state. Tucked under a cliff of hardened volcanic ash in a tributary to the Aravaipa Canyon, the house was constructed in the early 1930's from an old Indian shelter cave. 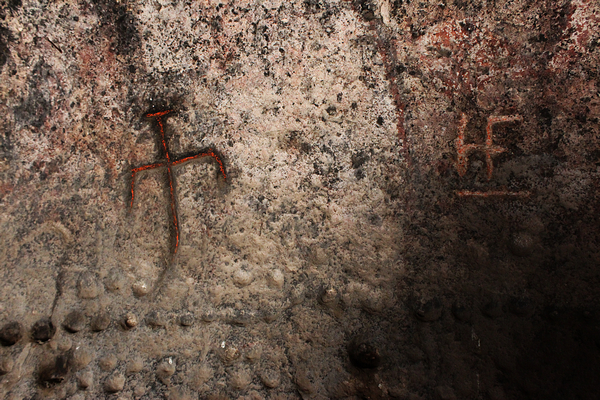 Figures and other symbols "painted" on the cave walls give the location its name. The house was built by a colorful and controversial character by the name of Jo Flieger. Flieger(pronounced Fligger) came to the area in the 1920's as a young cowboy. One of his early residences was a small cave near a water tank north of the Aravaipa. As he matured, he realized that if he ever was going to be married, he would need to be able to offer a better place to live. In other words, he needed a larger and nicer cave! His efforts apparently paid off. He did find a wife and the couple lived at this house for seven years. In this photo, it can be seen how the front wall of the house was constructed to close off the opening of the cave. Mr. Flieger wrote in his book, "Dreams Come True For Cowboys Too", that the room on the left was constructed away from the cliff to be able to catch the cooling breezes circulating in the canyon. Flieger told a story that one time he and his wife returned home to find a hole dug at the base of the large tree in the photo. To the side was a recently excavated dutch oven and a crumpled up newspaper article that described a train robbery that had taken place near Willcox in 1889. It was obvious that the paper had been wrapped around a batch of coins. They were no longer there. Were the missing coins and the newspaper article related? The Fliegers thought so. But who had dug up them up and why had it taken so long to recover them? The soot covered ceiling from the Indian days is evident in these photos. The interior walls are made of concrete and divide the cave into three rooms. Mr. Flieger hired a worker to do that work for him. Needless to say, it was a major effort to get the cement packed into this area. 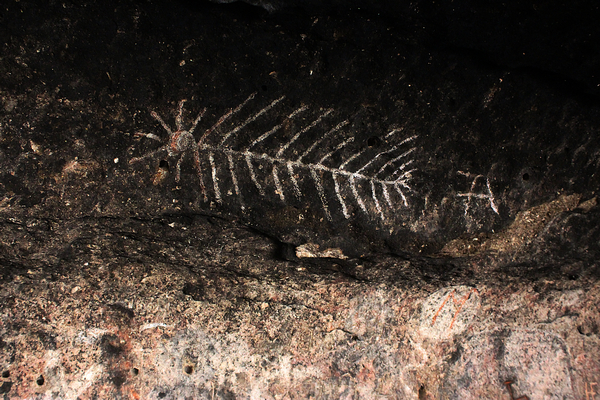 These are closeups of several of the drawings of figures and cattle brands that have been highlighted on the cave wall. There are others that are really faint. I am not sure whether the rows of holes are natural or not. I have seen similar features elsewhere that were definitely man-made. The Fliegers did not use the heater much. The cave environment moderated the outside temperatures. The large windows keep the interior of the cave suitably bright. Outside the house, Mr. Flieger constructed a small barn that had a blacksmith setup that he used to construct gate hinges and other hardware. There were substantial corrals built. Two concrete dams captured some of the water that flowed in the canyon. The canyon below the cave house becomes very rough. The Aravaipa Canyon is not far. I am not sure how navigable the route is going in that direction. The cave house is situated in a very scenic location. The volcanic ash layers have eroded into interesting formations. Large cottonwood trees provide shade during the warm months. From the canyon rim above the house the views are outstanding. To the south can be seen the gorge of the Aravaipa Creek and further on are the outlines of Table Mountain and Holy Joe Peak. As the Fliegers became more established their ranching operations expanded onto neighboring properties. 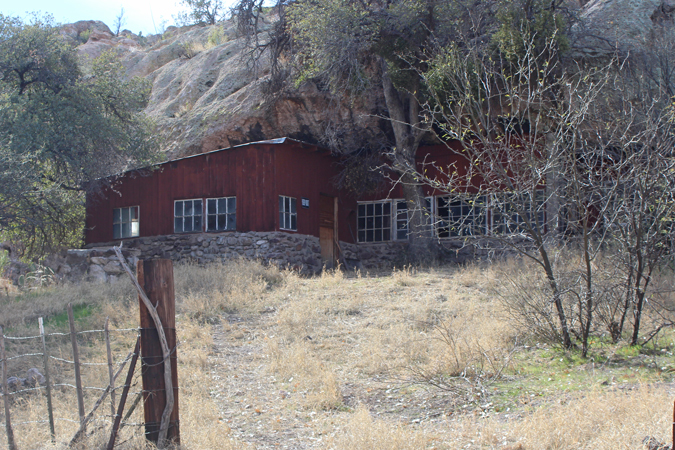 Approximately 10 miles to the west, an old goat ranch was purchased and a road was built up the steep mountainsides to connect to the Flieger rangelands near the cave. It was that road, that is now closed to vehicular traffic, that I used to walk to the cave. 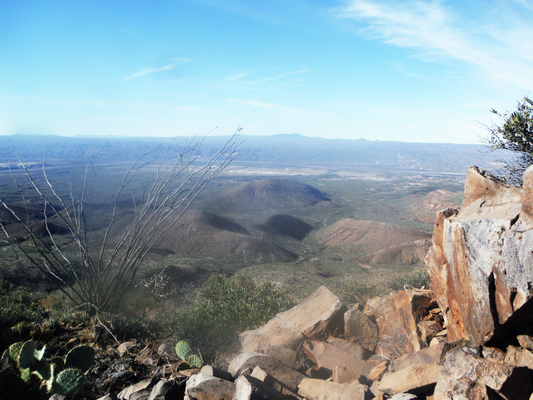 It was a very strenuous hike that involved an elevation gain and loss of more than 1500'. The distance to the cave house and back was slightly more than 20 miles. The photo below was taken from the shipping corrals at the old goat ranch. The cave house is 5 or 6 miles beyond the skyline ridge. 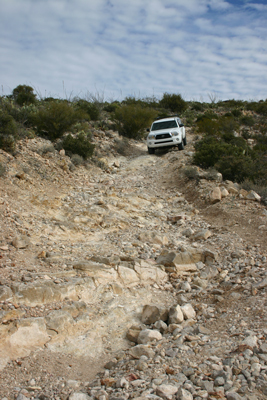 A few years ago, the ranch road was open to vehicular traffic. This section of road was typical of the overall road condition. It was pretty rough then! It is now a difficult path to walk. 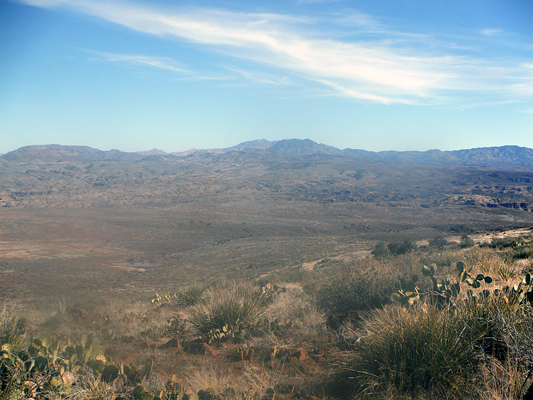 This is one of the views to the west from the skyline above the corrals. It is impossible to see, but my truck is parked at the base of the dome shaped hill in the center of the photo. It was not a peaceful time when Mr. Flieger first came to this area. Neighbors fought each other for the control of range land and water sources. Cattle rustling was commonplace. There were several shootings and murders. Jo Flieger at different times, was both the victim and the accused. Red Basin, in the photo below, was part of that contested land. Today, much of it is not privately held, but has been re-appropriated to the San Carlos Indian Reservation. My original thoughts on the hike were to camp at the cave house site. But when I came across these pools of water a half mile or so above the house, I could not resist setting my pack down and calling the place home. It was a very pleasant stroll without the pack on down to the house. As far as the ownership status of the cave house, Flieger wrote that he paid $500 for the property. There is no evidence that he ever proved up on the location to gain any kind of patent. The current owner of the Fleiger ranches told me that it is on State Trust Land. 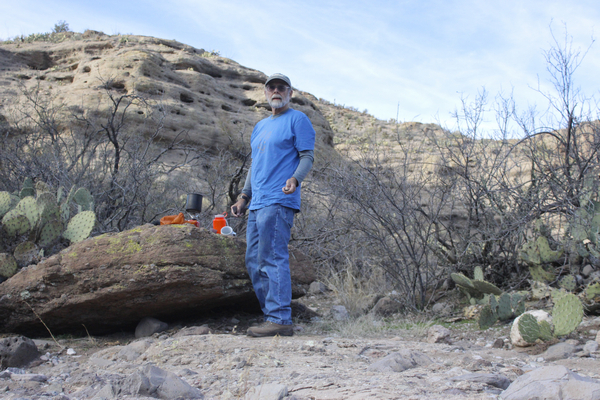 I can find no record at the Pinal County Assesor's office that there is any privately held land anywhere in the section of land that the cave house is located in. The place is obviously being kept up by someone. Hopefully, that will continue.